All parts of the plant contain the alkaloid berberine - this is most concentrated in the roots, stems and inner bark, and least concentrated in the fruits. In small quantities berberine has a range of effective medicinal applications but, in excess, can cause vomiting, lowered blood pressure, reduced heart rate, lethargy, and other ill-effects. The fruit of most, if not all, members of this genus are more or less edible and can be eaten in quantity since the levels of berberine in the fruit are very low. E. Asia - southern and western China. This species hybridizes freely with other members of this genus. 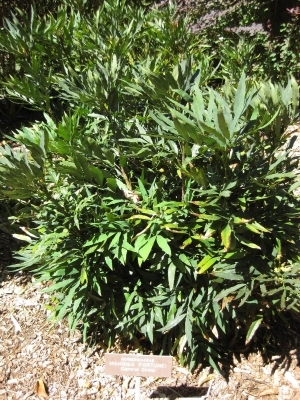 A review of the medicinal uses of the genus Mahonia in China. ]. A 3 weeks cold stratification will improve the germination of stored seed, which should take place in 3 - 6 months at 10°c. Prick out the seedlings when they are large enough to handle and grow them on until large enough to plant out.